On Mother’s day, 2014, Beaver Crossing Nebraska was hit by an EF-3 Tornado, leaving nearly 1/3rd of the small Midwestern town’s homes either severely damaged or destroyed. Among those, one belonged to the Timmermans—a family that has devoted their lives to keeping their community safe. As volunteer first responders, Suzy and Jesse’s first priority during, and after, the storm was the town’s residents. Jesse was in harm’s way of the storm’s path while spotting for the Beaver Crossing Fire Department. As an EMT, Suzy hunkered down in the Emergency Services building in anticipation for rescue and recovery calls. The entire family, including their two daughters Alycia and Eliza, who were safely sheltered in their grandparents basement, survived the storm but were left displaced by the destructive wrath. 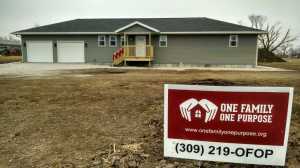 In December of 2014, ONE FAMILY ONE PURPOSE responded by building the Timmermans a new home.